The ALMA (Atacama Large Millimeter/submillimeter Array) astronomical observatory took another step forward and upward, as one of its state-of-the-art antennas was carried for the first time to Chile's 16,500-foot-high plateau of Chajnantor on the back of a giant, custom-built transporter. The 40-foot-diameter antenna, weighing about 100 tons, was moved to ALMA's high-altitude Array Operations Site, where the extremely dry and rarefied air is ideal for observing the Universe. base camp visible in background. The conditions at the Array Operations Site on Chajnantor, while excellent for astronomy, are also very harsh. Only about half as much oxygen is available as at sea level, making it very difficult to work there. This is why ALMA's antennas are assembled and tested at the lower 9,500-foot altitude of the ALMA Operations Support Facility (OSF). 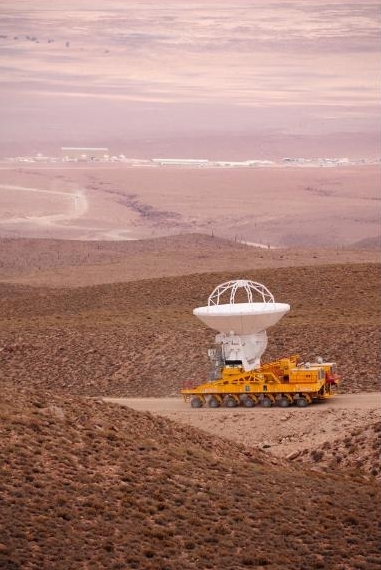 It was from this relatively hospitable base camp that the ALMA antenna began its journey to the high Chajnantor site. "The successful transport of the first ALMA Antenna to the high site marks the start of the next phase of the project. Now that we are starting to move the ALMA antennas to the high site, the real work begins and the exciting part is just beginning," said Adrian Russell, North American ALMA Project Manager. The antenna's trip began when one of the two ALMA transporters lifted the antenna onto its back, carrying its heavy load along the 17-mile road from the Operations Support Facility up to the Array Operations Site. While the transporter is capable of speeds of up to 8 miles per hour when carrying an antenna, this first journey was made more slowly to ensure that everything worked as expected, taking about seven hours. The ALMA antennas use state-of-the-art technology, and are the most advanced submillimeter-wavelength antennas ever made. They are designed to operate fully exposed in the harsh conditions of the Array Operations Site, to survive strong winds and extreme temperatures, to point precisely enough that they could pick out a golf ball at a distance of nine miles, and to keep their smooth reflecting surfaces accurate to less than the thickness of a human hair. Once the transporter reached the high plateau it carried the antenna to a concrete pad -- a docking station with connections for power and fiber optics -- and positioned it with an accuracy of a small fraction of an inch. The transporter is guided by a laser steering system and, just like some cars, also has ultrasonic collision detectors. These sensors ensure the safety of the state-of-the-art antennas as the transporter drives them across what will soon be a rather crowded plateau. Ultimately, ALMA will have at least 66 antennas distributed over about 200 pads, spread over distances of up to 11.5 miles and operating as a single, giant telescope. Even when ALMA is fully operational, the transporters will be used to move the antennas between pads to reconfigure the telescope for different kinds of observations. This first ALMA antenna at the high site will soon be joined by others, and the ALMA team looks forward to making their first observations from the Chajnantor plateau. They plan to link three antennas by early 2010, and to make the first scientific observations with ALMA in the second half of 2011. ALMA will help astronomers answer important questions about our cosmic origins. The telescope will observe the Universe using light with millimeter and submillimeter wavelengths, between infrared light and radio waves in the electromagnetic spectrum. Light at these wavelengths comes from some of the coldest, and from some of the most distant objects in the cosmos. These include cold clouds of gas and dust where new stars are being born, or remote galaxies towards the edge of the observable universe. The Universe is relatively unexplored at submillimeter wavelengths, as the telescopes need extremely dry atmospheric conditions, such as those at Chajnantor, and advanced detector technology. The Atacama Large Millimeter/submillimeter Array (ALMA), an international astronomy facility, is a partnership of Europe, North America and East Asia in cooperation with the Republic of Chile. The National Radio Astronomy Observatory is the North American partner in ALMA. ALMA, the largest astronomical project in existence, is a revolutionary telescope, comprising an array of 66 giant 40-foot and 23-foot diameter antennas. Russell noted that the first antenna's move to the high site illustrates the international nature of the project. "A Japanese antenna with North American electronics was carried by a European transporter," he explained.